Thank you for your support during this difficult time. Please enhance this tribute to Eunice by adding your memories. Eunice Irene Ward, 90, of Goose Creek, SC, widow of Burton Ward died July 3, 2018. Her Funeral Service will be held Thursday, July 12, 2018, in the J. Henry Stuhr, Inc., Northwoods Chapel, 2180 Greenridge Road at 1:00 pm. Interment will follow at Carolina Memorial Park. The family will receive friends from 11:00 am until the time of the service. Eunice was born September 26, 1927 in Williamsburg County, SC, daughter of the late Fred Lee Moore and Bessie Eunice Coker Moore. She was a retired store manager with S& H Green Stamps. She was a member of Northwood Baptist Church. 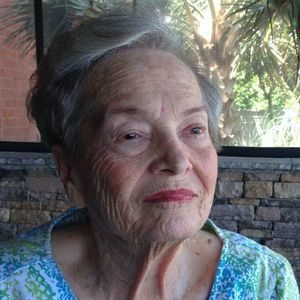 She is survived by two daughters, JoAnn Smith (Percy) of Summerville, SC; Janet Ann Ward (Raffaele Buono) of Goose Creek, SC, two grandchildren, Robyn Welfring, Ward Smith and four great-grandchildren. She was preceded in death by her brother Ted Lee Moore and two sisters, Virginia Hinson and Elizabeth Wells. Janet and Raff would like to especially thank Mary Henderson, Judea Singleton, Ndeye Drame and all the staff at Hospice of Charleston for all their love, help and care over Eunice's last years. Flowers will be accepted and memorials may be made in her name to Hospice of Charleston, 4975 LaCross Road, Suite 200, North Charleston, SC, 29406 and/or Charleston Animal Society, 2455 Remount Road, North Charleston, SC, 29406. On behalf of the Charleston Animal Society, I want to thank you for asking for donations in lieu of flowers in honor of Ms Eunice Your kind gesture in honor of Her memory will leave a legacy of hope for homeless animals. We are extremely saddened by your loss and hope that knowing that her memory will be helping so many animals is a small comfort to you. Thanks so much! For the animals I am, Kay Hyman, director of Community Engagement Thank you so much for suggesting donations to Hospice of Charleston and the Charleston Animal Society. My thoughts and prayers to Janet , Robyn and family. Heaven has received a lovely lady . your heavenly light shines for eternity. RIP. Sincere condolences to you and your family Janet. You are in our thoughts and prayers at this very sad and difficult time. My prayers go out to JoAnn and Janet and the rest of the family. To know Aunt Eunice is to love her. She leaves all of us with great memories. What a lovely picture of Mrs. Eunice! So sorry we have lost her physically. She will always be in our hearts and minds! She was a jewel cherished by those who knew her. Generous, fashionably dressed, humorous, hardworking and fun loving, Aunt Eunice was a special person one of a kind. She was a great cook and you were always welcome at her table. And there was no declining a slice of one of her fabulous deserts. She was at her funniest correcting other drivers on the highway, and some of her best one-liners were delivered to politicians who, unfortunately, never heard her through the TV set. Politics was a passion and she was always current. She was a devoted wife, mother and aunt. She was not only a sister-in-law; she was a dear friend to my mother. She was my beloved aunt. I will miss her terribly while I enjoy all the wonderful memories. Life Stories provides friends and families a forum to post their favorite stories and memories of Eunice Irene Moore Ward ensuring the precious experiences are never forgotten. Share joyful times, post a photo that captures the moments you cherish, and allow others to reply, relive and remember.